Most definitive assessment of heart disease risk with the EBT Coronary Calcium Scan. The Carotid Ultrasound Screen is a painless non-invasive screening assessment of stroke risk. The newest and less-invasive option for safe, accurate, non-sedating colo-rectal cancer screening. For your convenience, you may download fill out the paperwork at your leisure. Save time and bring the forms with you when you come in for your appointment. Screening and diagnostic lung scans for early detection of lung cancer and other lung diseases. Call us for a pleasant alternative for diagnostic scans, which are ordered by your doctor. Front Range Preventive Imaging in Boulder, Colorado, is in the business of saving lives through early diagnosis of disease. This early diagnosis is done by various state-of-the-art scanning procedures. We have the best technology, equipment and staff to find heart disease, stroke, lung cancer and colon cancer at their early stages – when treatment options have the best chance for success. What sets us apart initially, is the pleasantness of our surroundings, the promptness of our staff and the fairness of our pricing. What really sets us apart is our technology. Front Range is the only center in Colorado that uses the FDA approved Electron Beam Tomography (EBT) scanner technology to check for heart attack risk. EBT technology is considered the Gold Standard of coronary calcium imaging for the most definitive assessment of heart disease. 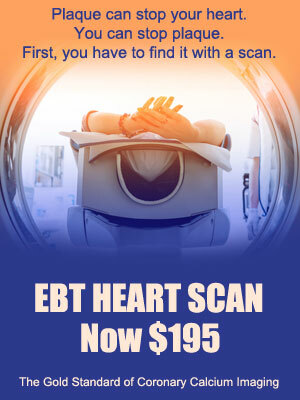 The EBT is 3 times more accurate and 1/3 the radiation of any other heart scanner in Colorado. Our center has experienced physicians and technologists to ensure the best quality results possible. We are dedicated to the early detection and prevention of disease especially: heart disease, lung cancer, colon cancer, and others. The top causes of death in adult Americans are heart disease, lung cancer and colon cancer. But what if this could be prevented? If cancer and heart disease are curable, why are those the top causes of death in Americans? Simply because heart disease and cancer are not caught early enough to cure them. Prevention is key.